Hope you’ve had a lovely break and we’ll be back in the garden blowing away the cobwebs and making some 2014 garden resolutions (tidier polytnnel! more soup cooking! and more!!) on Saturday 4th January 10-2. It’s time to get off the sofa and back in the garden. Lots more exciting newsw for 2014 coming soon!! This entry was posted in News from the Garden on December 31, 2013 by GHCG. Yup it’s rubbish but we’re staying cheery. We’ve already got the chestnuts and cider so we’ll be in the garden in the shelter tomorrow – Thursday 6:30-7:15!! Smaller, but still with lots of carols. COME COME COME!! This entry was posted in News from the Garden on December 18, 2013 by GHCG. 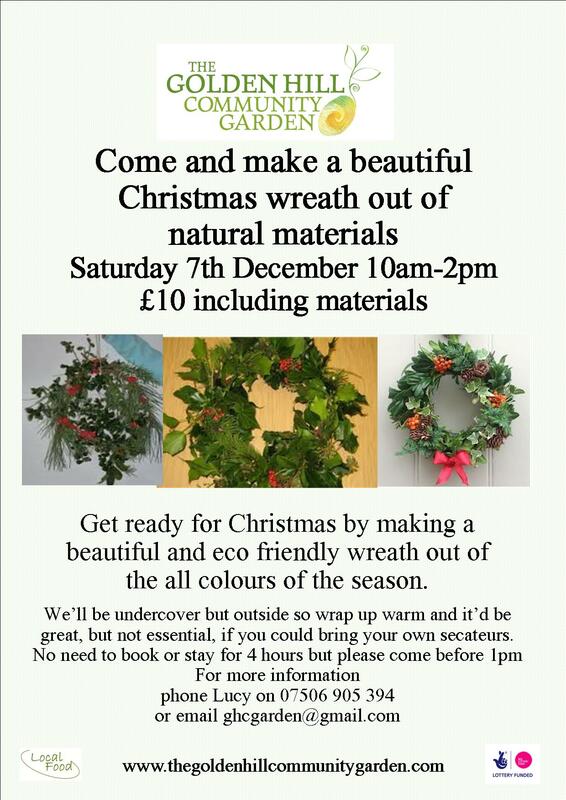 Just a few day until our gorgeous Christmas event!! 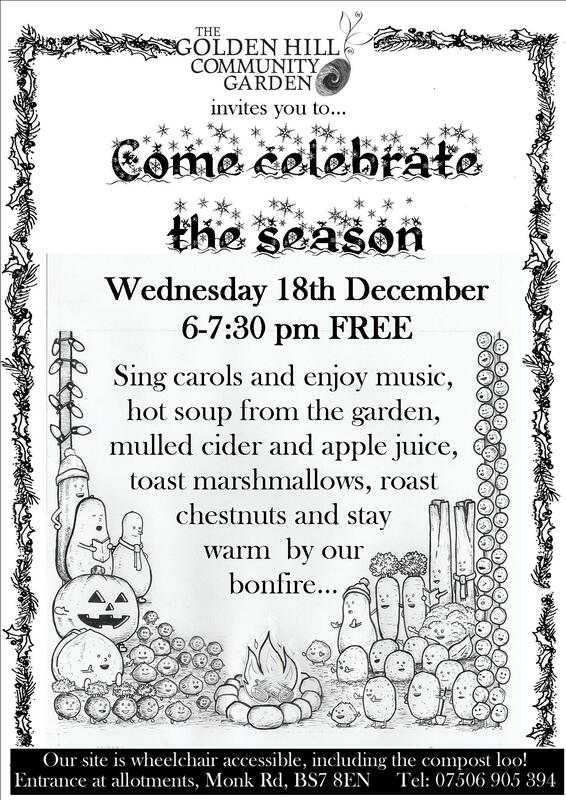 We’ll be quite literally roasting chestnuts on an open fire, singing carols to the stars, enjoying hot soup with veg from the garden, hot and spicy local cider, toasting marshmallows and MORE!! Next Weds 6-7:30. EVERYONE WELCOME!! This entry was posted in News from the Garden on December 12, 2013 by GHCG. Here’s three things to be to jolly about!! Which is going to be really fun and if you could bring any ivy, greenery and especially things with berries along that would be really helpful! Thanks to Tony Wilhelm for illustrating this lovely poster, the keen eyed will recognise some of the lovely veg from the Harvest Fair Poster! This is going to be a lovely and laid back evening with plenty of singing and chatting and eating of tasty things and staying warm by the bonfire. They’ll be songsheets so everyone can join in and musical accompaniment to (most of) the carols. Please invite friends and family and tell your neighbours and print this poster out and put it up in your windows, nurseries or anywhere!! AND if you’d like to help on the night handing out song sheets, or serving soup or drinks then let me know – just 30 mins or 1 hour would be lovely. It’s help from you that makes this all possible!! Also let me know if you can bake a cake or mince pies! And finally we are hardy souls but even we don’t like gardening when it’s frosty, cold and dark so we’re moving into winter opening times for December and January 11am-3am every Wednesday AND committed though we are we’ll be closed Christmas day and New Year’s Day. Oh and we didn’t win either or the awards we were shortlisted for, but they went to lovely folks and we know we are all winners, I mean, awards are great but pizza and watermelons and having all you guys on board is much much better. This entry was posted in News from the Garden and tagged christmas, christmas carols, garden, wreath making on December 3, 2013 by GHCG.